Microsoft has some big plans for the future of the PC if alleged Windows 8-related documents recently leaked online are correct. 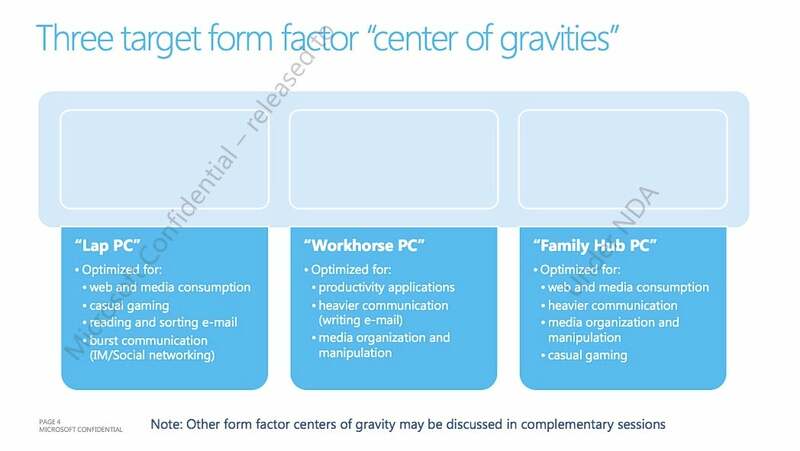 Nearly 18 documents--supposedly confidential internal Microsoft plans--have surfaced, including one called "Modern Form Factors" that shows that Microsoft may be looking at three broad PC categories for the future: Lap PC, Workhorse PC, and Family Hub PC. Here's a quick look at each category from the document, and some of the interesting things Microsoft may be thinking about. But keep in mind while you're reading that these are just broad goals (if they are even the real thing), and the document is more about Microsoft's general vision than an actual product roadmap. Nevertheless, take a look and see what you think. The workhorse PC is essentially the PC you have today, but Microsoft wants to add a facial recognition and proximity sensor feature called "My PC Knows Me," according to the leaked documents. The basic idea is that you walk into the room where your PC is, and the proximity sensor detects your movements and wakes the PC. As you sit down at the desk, your PC is already on so it can scan your face to log you in. The computer can also switch between different user accounts with the facial recognition feature. 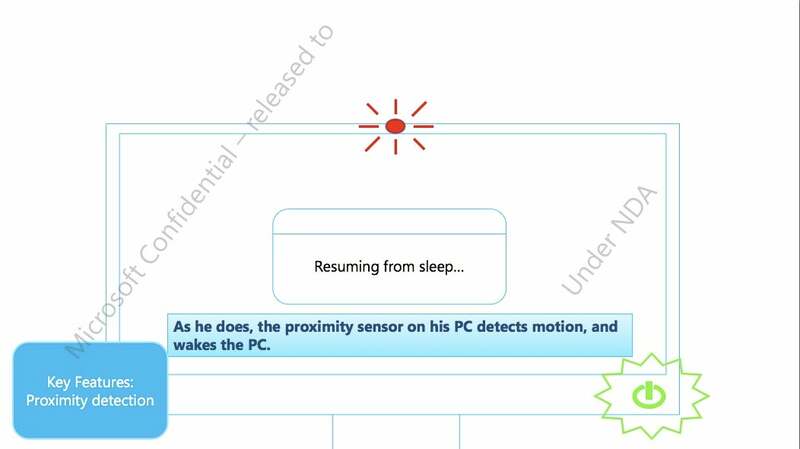 Once you've finished using the computer and leave the room, the proximity sensor detects that no one is around, logs you off, and puts the computer to sleep. The Lap PC is basically a tablet, according to the leaked document, and pretty much describes what the iPad can do today. The Lap PC would include an accelerometer used for gaming and to adjust screen orientation between portrait and landscape modes. The Windows tablet would also have ambient light detection, a touch-based interface, virtual keyboard, and location-aware capability. Tying into the Workhorse PC's "My PC Knows Me" feature, the Lap PC would also have something called attention detection software, a feature the iPad doesn't have. 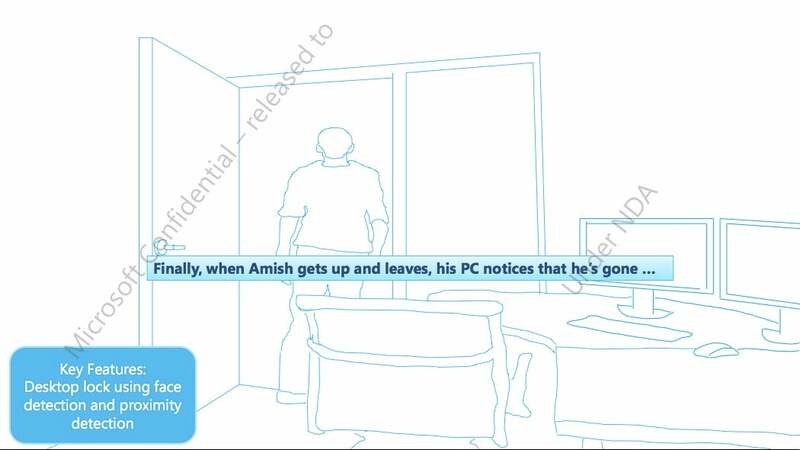 The scenario Microsoft describes has you using the PC to play a video game when someone knocks on your bedroom door. You look away to see who it is, and your computer uses the built-in Webcam to detect that your eyes are no longer directed at the screen. So the PC automatically pauses the game you were playing until your eyes come back to the computer's display. It's an interesting idea, although I'll admit the idea that my computer would constantly be scanning my face has a bit of that creepy Sci-Fi feel to it. Nevertheless, I'd be interested to see if this could work in something like a tablet. Microsoft is still hoping to place a Windows computer in the family living room to act as the media hub for the entire house. Using the Family Hub PC, you would be able to take a photo slideshow from your laptop and transfer it to a larger screen display in your home office. You could also select a saved or online video from the laptop and transfer that to the TV downstairs. All of this functionality would run through a device hub that could direct content from the laptop to the TV in the living room or to the computer monitor upstairs. The device hub would be able to send data not only between your PCs and laptops, but your televisions, computer monitors, and other peripheral displays and devices. This concept is nothing new; you can achieve much of this functionality already using a variety of devices and software like Windows Home Server, Windows Media Center, Xbox 360, Apple TV, Internet-capable HDTVs, and the forthcoming Google TV. The problem with the integrated home computing concept is that it has never been easy for users to set up, a problem that Microsoft would have to solve. The purported leaked Windows 8 documents offer an interesting view into what Microsoft is rumored to be thinking about for the future. How much of this we'll actually see in real products is anybody's guess. It's not entirely clear where these documents came form, but the forum win7vista has apparently had them available for download since June 19.